Bayside Resort Vacation Rentals in W. Fenwick Island / Selbyville DE near Bethany Beach, DE and Ocean City MD brought to you by Bethany Beach Home Rentals and Keller Williams Realty. 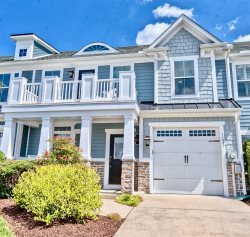 Spend your vacation here at Bayside Resort in W. Fenwick Island and rent this wonderful luxurious One-Story 3 bedroom, 2.5 bath Luxury House, with freshly painted exterior, overlooks one of the neighborhood lakes in a quiet area of the community near pools. Features of this home include gorgeous hardwood and large ceramic flooring, a tray ceiling with recessed lights in the owner's suite along with a large frameless shower and separate tub. Other features include Bose surround-sound, granite countertops and Stainless Steel Appliances in the kitchen, screened porch and deck. The 2-car garage, 1-car carport, and very spacious driveway offers plenty of room for you and your guests to park. Spend your free time at one of Bayside's many pools (both indoor and out, playing tennis, golf, or crabbing at the bay. Take the beach shuttle to Fenwick Island state park or ride your bike to the Freeman Stage, shops, and restaurants within Bayside. Located in the award winning community of Bayside which offers outdoor and indoor pools, fitness center, clay tennis courts, fishing pier, kayak launch, restaurant, Jack Nicklaus golf, award winning Freeman Stage and much more. This home is walking distance to the "commons pool" and beach shuttle stop. Just minutes to Beaches, Bays, Shopping including Ocean City, MD, Bethany Beach, DE, Rehoboth Beach and everything the area has to offer! Whether you’re searching for high-octane family fun or the pleasure of quiet reflection, you’ll find it at Bayside. Head to Sun Ridge, the center of it all, for splash zones, swimming, tennis and much more. Or, stroll over to The Commons and enjoy a family picnic by the pool, bocce ball, or fishing at our stocked ponds. Where human nature meets Mother Nature, you get the best of both worlds. The Point at Bayside is a sanctuary of simple pleasures, both relaxing and invigorating. Hike trails with breathtaking scenery and Ocean City skyline views, drop a line off the pier to snare a crab or two, or select from a fleet of kayaks and paddle boards. It’s all right here. Miles of trails through the community is just another reason to love living at Bayside. Whether it’s for walking, jogging or just socializing, it’ll be a change of breathtaking scenery every time you lace up your sneakers. Opening in the fall 2017, is our new fitness and aquatic center. Featuring a heated 75 foot 5 Lane indoor pool, hot tub, multi-purpose and aerobics room and a fitness area with state of the art equipment for strength training and cardio. Service hours are 10:00 AM to 6:00 PM from Bayside to Fenwick Island State Park from Memorial Day weekend through Labor Day weekend. The shuttle leaves Bayside on the hour and returns from Fenwick Island on the half hour dependent on traffic. There are five pick-up and drop-off areas; Main Entrance parking, Magnolia Tree, Sun Ridge Pool, Commons Pool and the Shoals Entrance. Signs are posted to indicate the specific locations at each site. Overlooking the 18th green, The Cove Bar & Grille offers stunning lakeside views and a casual dining menu that is sure to delight the whole family. You can’t miss The Cove’s delectable weekly specials or s’mores by the fire pit. Stop in after your round of golf to enjoy our legendary Orange Crush or a local brew. Open to everyone! THE FREEMAN STAGE AT BAYSIDE! Imagine going to the theater in your own backyard, gathered with family, friends and neighbors, swaying to the sounds of award-winning artists as the sun goes down. A program of the Joshua M. Freeman Foundation, The Freeman Stage features a diverse and venerable line-up of dance, theater, children’s performances and concerts by award-winning artists. Visit the Freeman Stage site for the complete schedule. Prices and availability are subject to change without notice until a reservation is finalized.